Right now our main focus for apps has been the WordPress blogging platform. We’re big fans of WordPress over here and wanted to make sure you know why. When we tell people what we do, we often get the classic “okay, you lost me at WordPress.” So what is WordPress? WordPress is a free blogging platform that provides flexible customization. A WordPress site can be as basic or as advanced as you or your web guy knows how to make it. Web designers love WordPress as a basic framework that they can furnish to their hearts’ content. And if you’re just getting started, WordPress also curates a fantastic library of blog themes that you can choose from. There are many things to love about WordPress, but for now we’re going to tell you just a few of the ones we think are the most important. WordPress has an excellent control panel – the dashboard. Logging into the dashboard on your browser will give you the ability to make posts and edit content anywhere on your site. Uploading media, previewing a change before it goes live, and controlling your search keywords (more on that in a minute) are all easily accessible features. If you have an app, the content would be pushed out onto devices the second you hit the “post” button. 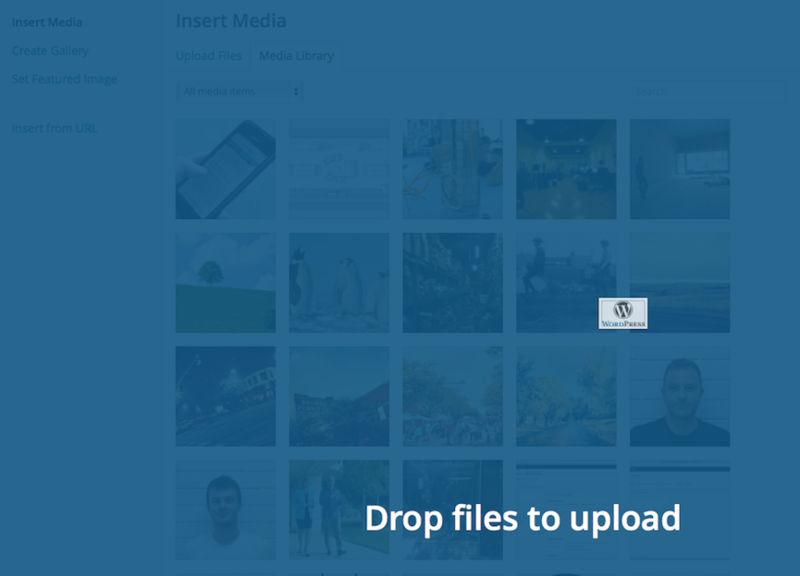 Uploading media such as photos is literally drag-and-drop. One of WordPress’ main strengths is the control that it provides you over search engine optimization (SEO). Every post and page that you create can have its own description and keywords. And because the code is simple and easy to navigate, search engines are able to be highly efficient as they crawl through the site. In addition to the default features, there are hundreds of plugins that you can use for getting the most out of your SEO. User management on WordPress allows you to collaborate with a team while keeping an established hierarchy. The administrator runs the site and sets permissions for the editors who streamline site media and the authors who write the content. One of the most important user features is the commenting system. As we’ve discussed, interaction with blog readers is essential, and WordPress makes it simple for anyone to comment within seconds. A crucial component of any successful brand is an independent identity. Setting up WordPress on your own domain is simple and will make your site more accessible and professional (wovax.com vs. wovax.wordpress.com). 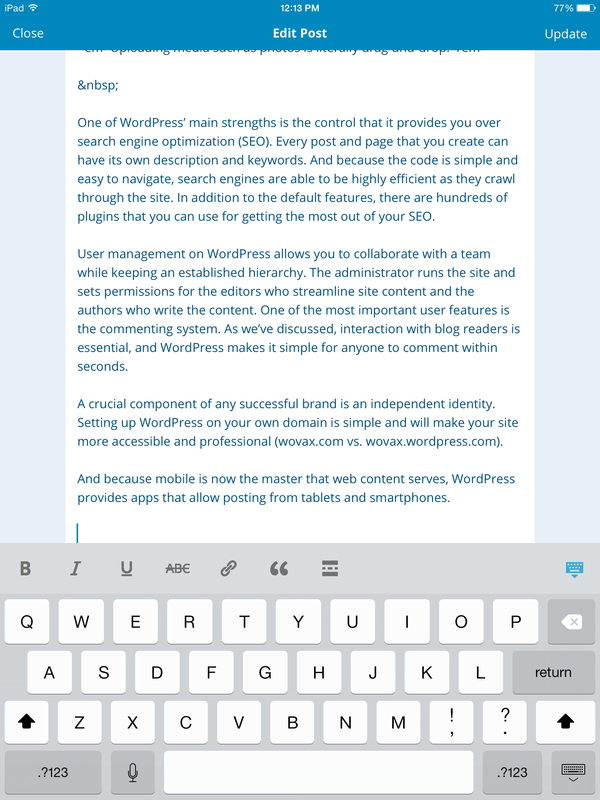 And because mobile is now the master that web content serves, WordPress provides apps that allow posting from tablets and smartphones. So meta. Such convenient. Very WordPress. Wow. Info dumps are never helpful, so we’ll leave it at that for now. Soon we’ll discuss more about the customization features of WordPress; specifically our top plugins that you will find incredibly useful.